What are your favorite Cookbooks, I was asked recently. Well, that was a very tough question for me to answer. I love my Bobby Flay collection for his layered flavors and Soutwestern flair. My William Sonoma Savoring India has proven delicious and helpful as I explore vegetarian dishes. The Complete Guide to Vegan Substitutions book I recently purchased has also been great fun to work through. For baking I love In The Sweet Kitchen and at Thanksgiving I always reach for my tattered Fannie Farmer to check how long to cook the turkey. 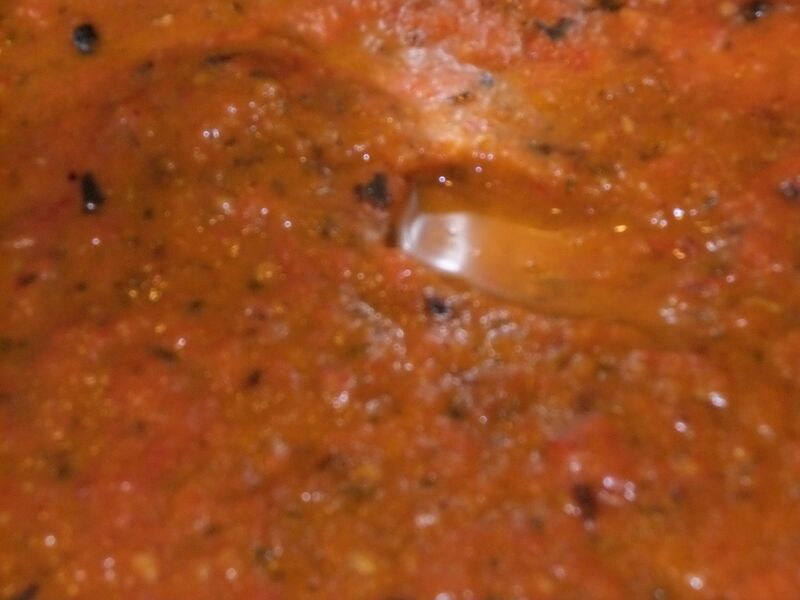 Daily Soup comes out in winter, Weber’s Art of the Grill in Summer…..and all the others when I need a new idea. Grazing by Julie Van Rosendaal has proven helpful when I need a little something to bring to a talk or meeting. So I ask you – what are your favorite cookbooks? Today I want to share an article written by Hilary Meyer, Associate Food Editor, EatingWell Magazine on Mon Oct 3, 2011 because it simplifies the mysteries of freezing foods. Last week I went to town on my freezer, throwing out all kinds of frozen packages from vegetables to meat to leftovers. I filled my 13-gallon trash can, then promptly walked it out to the dumpster for collection. I felt incredibly guilty about how much food I was tossing, but some of it looked more like a science experiment than something I would actually eat. I vowed to take better inventory of the stuff I store in my freezer, but I couldn’t shake the guilty feeling of being so wasteful. Was it really necessary to throw all that food away? So I looked into the facts about freezing foods and found some surprising information that will help me be a little more thrifty in the future. Myth: You can freeze all foods. Myth: You can freeze food indefinitely. Myth: Frozen food has fewer nutrients than fresh. Myth: Once thawed, food cannot be refrozen without cooking it first. Myth: You can store frozen food long-term anywhere in your freezer or anywhere that’s cold. How long do you keep food in your freezer? EatingWell Associate Food Editor Hilary Meyer spends much of her time in the EatingWell Test Kitchen, testing and developing healthy recipes. She is a graduate of New England Culinary Institute. Yes another trip to the farm for a bag full of fresh goodies! Today’s harvest included beets, more tomatoes of various shapes sizes and colors, poblanos, Diablo peppers, onions, jalapeno, corn, eggplant and a bell pepper. Sadly the summer crops are waning, the cool nights not conducive to flavor or growth, but the winter crops – squashes, cauliflower and more are not ready. So we will indulge ourselves in this last tomato harvest. Today, I am making a Kamut (grain), flagelot (french bean) and tomato salad with a tarragon thyme vinaigrette and some green onions. this is truly one of the best things I have eaten in a long time. The tarragon, Dijon and tang of the vinegar was so good next to the nutty hints from the kamut. The flagelots offered a starchiness, while the fresh tomato was so bright next to these flavors. OK, without sounding too much like a food critic, this was really good! I smoked corn over mesquite in my wok, resulting in the house smelling incredibly like bacon, to toss with black beans, a jalapeno, one of the onions and a little olive oil – smokey sweetness, starchy black beans and the kick of the pepper – a new favorite salsa/side dish. We had a herbed goat cheese stuffed shrimp with a fresh tomato sauce. Creamy cheese, acidic tomatoes and sweet shrimp were decadent together. Eggplants are going in Indian eggplant and potato stew loaded with spices. The beets – perhaps I will try pickling them, or just roast them to enjoy as is. I am the only one eating them, so my choice! The rest of the jalapenos are going to be stuffed with goat cheese, corn and green onions, topped with a grilled pepper and tomato sauce. There really isn’t enough week in the week to eat all of these goodies, and my freezer is full! That doesn’t stop us from scarfing down everything as soon as it is done (sorry no pictures this week – guess we were extra hungry). I hope you are enjoying the last of the summer crops, perhaps starting to think apples and pumpkins, and trying new combinations too. This Friday, I headed to the farm to see what goodies were being offered…I knew there’d be tomatoes. Heirlooms, plum, yellow, orange, and green…12 tomatoes in all. A few peppers, jalapenos (scored 2 more from the extra bin!). Corn that is questionable, per the sign reading “Your lucky day – free worm with every ear” and an eggplant. Edamame was available to pick your own. A small bunch of beets rounded out the basket. 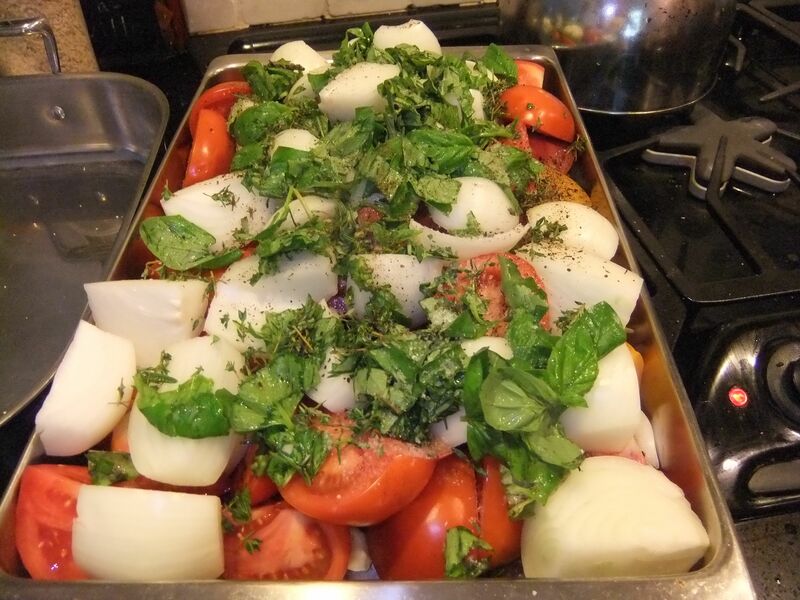 So many tomatoes were headed to a roasted tomato sauce – lot’s of onion, garlic and fresh herbs – I used basil, some thyme and rosemary from my herb garden. Olive oil and a long roast in a 450F oven. TVP meatballs and some pasta made great use of this delicious sauce. A classic, turned vegetarian and filling! Eggplant, what to do with you. My southwestern cookbook offered a roasted eggplant and tomato soup that sounded divine. 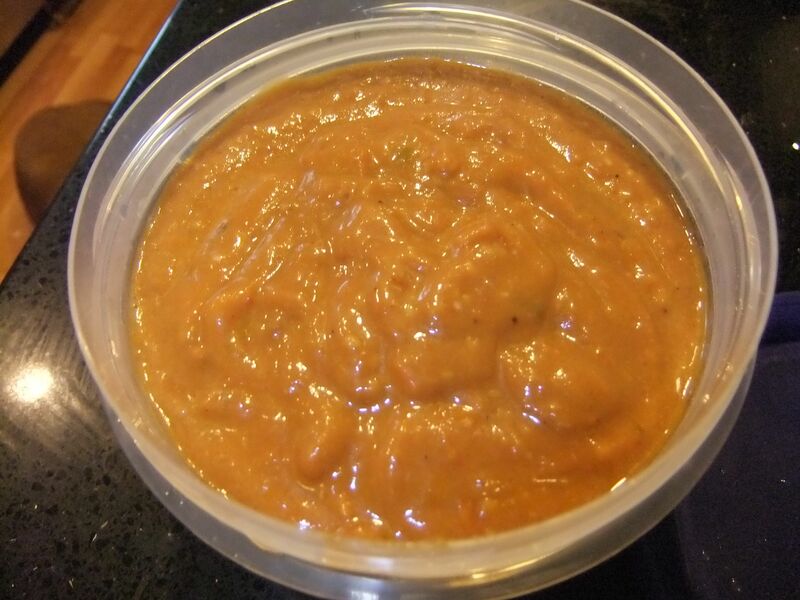 A little cayenne for heat, bell peppers, onions, more tomatoes and roasted eggplant slices pureed into smooth goodness. It was creamy, without milk, mild, yet full of flavor. A keeper for sure. The corn is going into a corn pudding to accompany the fish we shall pick up Tuesday. Think very soft cornbread, served with a spoon….the edamame made me break into my grain drawer, and I came up with Triticale – a cross between wheat and barley, full of protein and good carbs. Mixed with the edamame, balsamic, shallot, olive oil, and feta – a delicious side for lunchtime. Nutty, earthy and tangy with the vinegar. Beets – I sadly did not finish the roasted beets with orange and sour cream from last week – just too many good choices in the fridge, and not enough meals to finish eating them – so no roasted beets this week. 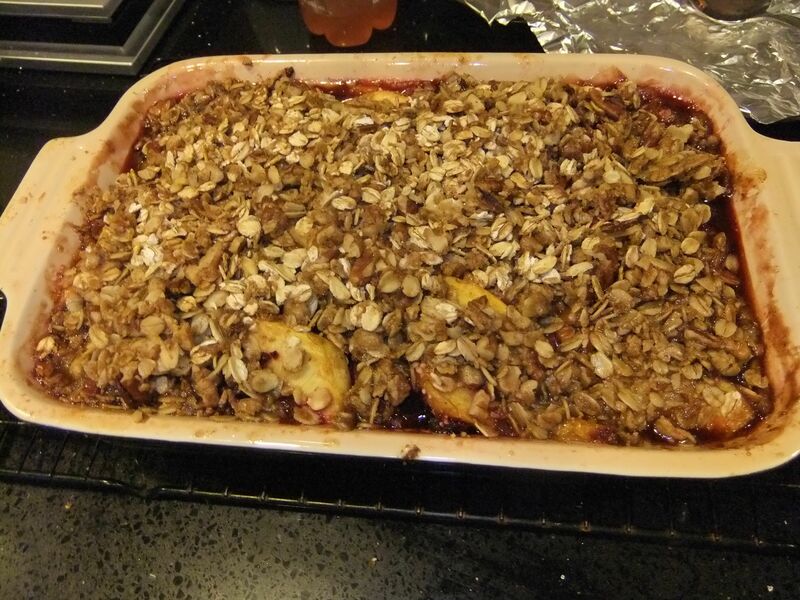 I decided to treat our house to a peach and beet crumble. Now this is an experiment in getting my husband to eat beets (he is NOT a fan). We had picked up some utility peaches (not pretty, but still tasty) from Ward’s Berry Farm and I decided the red beet color would be wonderful in the peaches, with an oatmeal crumble. Warm spices of mace, ginger, and cinnamon blended with shredded beets, sliced peaches, brown sugar and a little tapioca resulted in a wonderful cobbler. 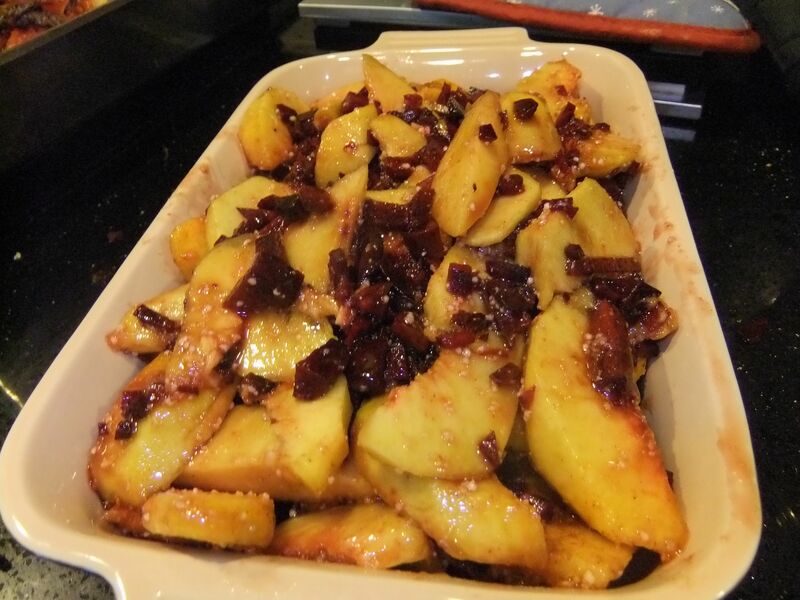 It had a slight beet flavor – sort of a “Hmmm what’s that taste”, but the sweetness of the peaches and crumble quickly took center stage. Unfortunately, my husband figured it out – are there beets in here? he asked puzzled. I can’t lie….. The peppers, jalapenos, carrots, canned tomatoes, tomatillos, and spices mixed with black eyed peas for a very spicy and colorful chili. Did I mention my husband is a HUGE fan of chili? SO every week, he gets a different variety of chili…at least for a while. Good way to use up and enjoy the veggies, and the heat was hot enough to suit even his palate. Another good week of eating, fresh from the farm. I hear there is cauliflower and broccoli coming soon….how do you prepare those? Bon appetit! 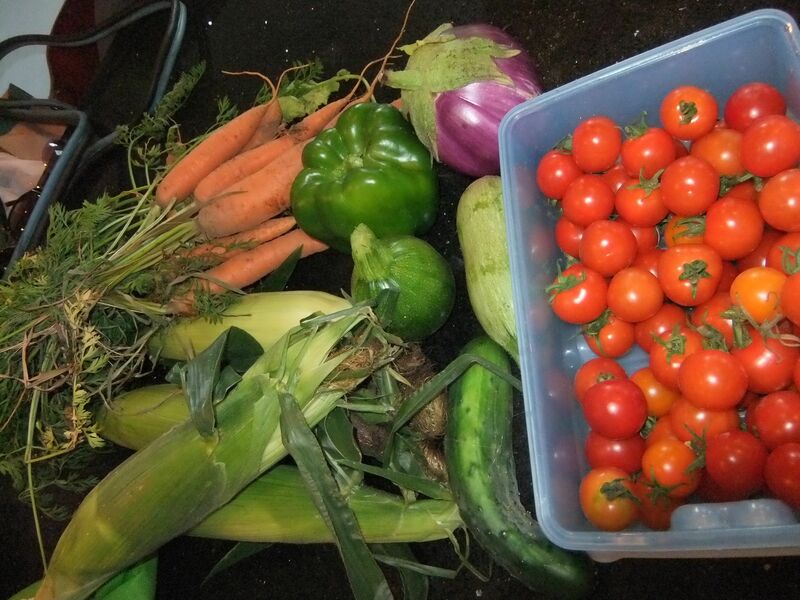 What a harvest it was this week! Tomatoes – heirlooms, cherry, plum and beefsteaks. Corn, zucchini, beets, carrots, mizuna, eggplant, cukes, peppers and a jalapeno. Beautiful “bouquet” of colors and flavors! 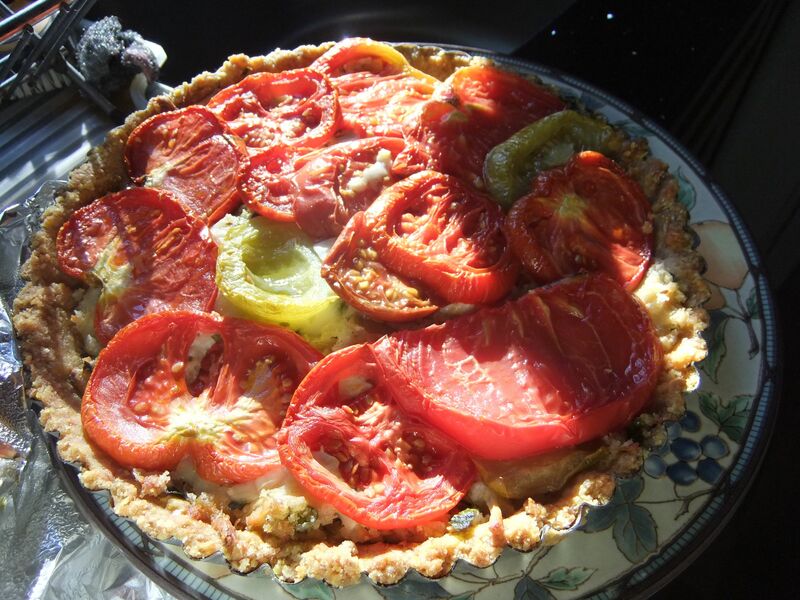 Where to start…..well the tomatoes looked fabulous and were perfect for a tomato tart with a cornmeal crust. Onions, cheeses,scallions line the middle of a cornmeal crust, topped with sliced heirlooms and baked. How pretty, delicious and a perfect lunch treat – think super fancy pizza! The eggplant was sauteed with chickpeas, peanut butter and red onion and garam masala for a wonderful vegetarian dish with tons of flavor. Oh, yes, I am starting a pescatarian (fish eating vegetarian) diet to feel healthier, perhaps lose a few pounds and experiment for my clients, building a vast resource of tried vegan/vegetarian recipes. This stew was a keeper! Corn is always best as is – we chose to grill it naked, producing a wonderfully nutty, condensed texture and flavor from the corn – almost popcorny, but still juicy. Our new favorite way to have corn on the cob! A mizuna salad with dried cranberries, toasted pecans and a pomegranate vinaigrette was delightful, sweet, bitter, and a unique addition to dinner. Sunday, Irene struck knocking power out by 10:30AM. Luckily, some of the tomatoes ended up roasted and pureed with champagne vinegar, bread crumbs and garlic for a roasted gazpacho – my new favorite recipe for this cold summer soup. Topped with cukes and pepper, perfect for power outages! So now the grill is our main cooking tool. Fish delivery on Tuesday offered 2 pounds of dabs. Couldn’t freeze it (still no power) so a pan was placed on the grill, oil heated and a cornmeal crusted dab swam in the hot oil. Grilled zucchini, carrots (wonderful roasted on the grill) corn on the cob and gazpacho finished this meal. Leftovers sufficed until Thursday when the power returned, and the cherry tomatoes were roasted with olive oil, salt and pepper for use in a tossed pasta. (not creative, I know, but so much to catch up on this week). Beets were roasted with a little herbs de provence and olive oil, dressed with a sour cream orange dressing and topped with toasted walnuts. Dinner party worthy, with fresh flavors from the dressing, earthy dark flavors from the roasted beets, and a slight floral note from the lavender in the herbs. Simple, elegant and so healthy! A vegetarian chili will finish up the remaining pepper, the black beans and tofu I bought for another dish, and lot’s of spices. Can’t wait to see what we get tonight!Happy Labor Day to all….and good eating! 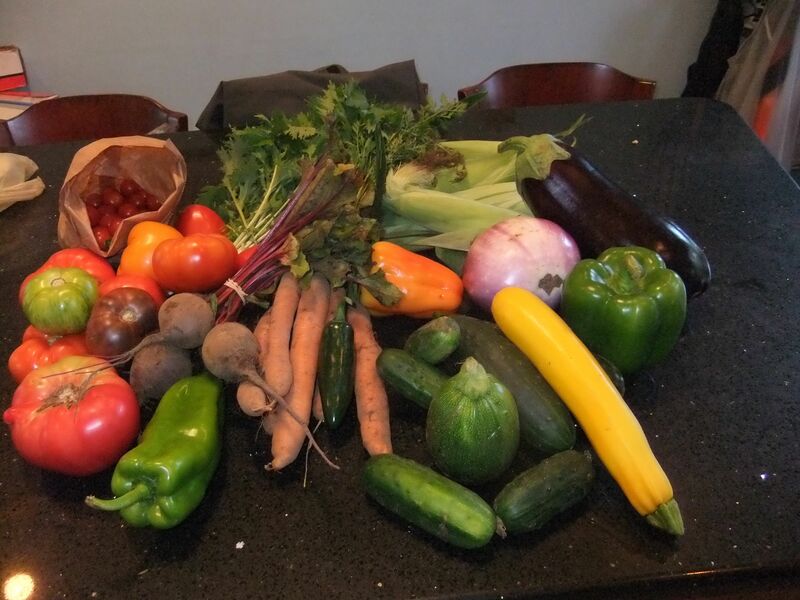 Another week of wonderful surprises from the farm….this week’s delivery included zucchini, yellow cherry tomatoes, yellow and several red tomatoes, red chard, cukes, radish, corn, a japanese eggplant, honeydew melon, and a light yellow bell pepper. Oh, yes, and one jalepeno. Now don’t get me wrong, but I must confess I am starting to get sick of zucchini. I love to eat it, but 3-5 zucchini a week is a lot for two people…..this week, I sauteed it with onion and sundried tomatoes to eat with broiled fish. This went over very well with my hubby, and I enjoyed some of the leftovers in an omelette the next day, with a little dollop of ricotta cheese folded in the middle. Yummy! The red tomatoes have been enjoyed just sliced, as they are SO good and sweet and taste like summer. The cherry tomatoes were turned into a delicious fresh salsa (Tyler Florenece’s recipe). 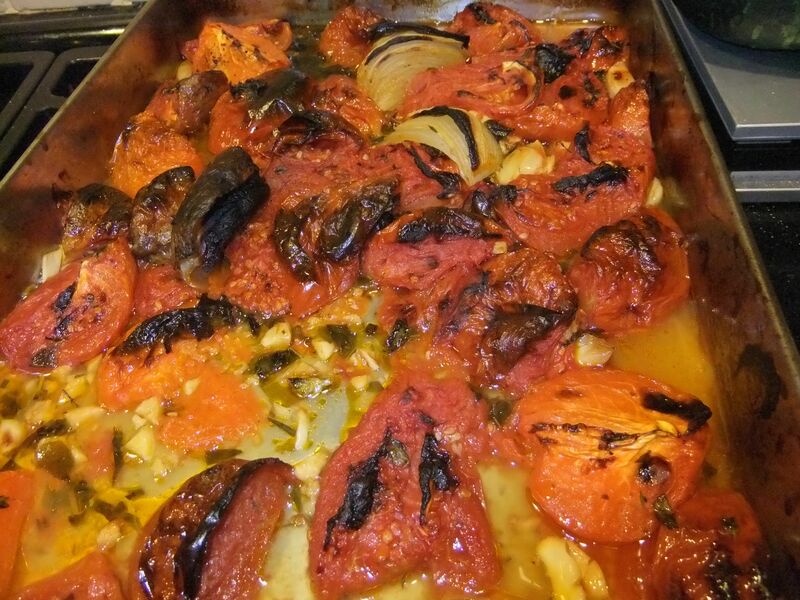 Roast the tomatoes tossed in oil until they burst, mix with lime juice, cilantro and the jalepeno. Simple and spicy. The light yellow pepper was tossed into a vegetable chili I made which was a nice break from meat. The eggplant was sauteed with tofu, black bean sauce and onions for a salty, savory vegetarain meal. The cukes were made into a salad with greek yogurt, peas, parsley and lemon juice and accompanied a roasted pork tenderloin in a Puerto Rican Marinde of spices and garlic. 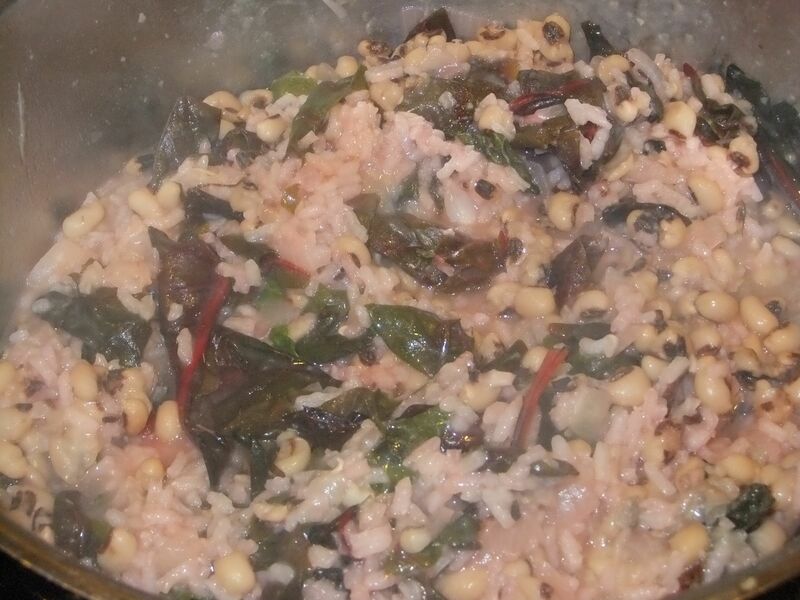 This was a big hit too….the corn was devoured as is – it has been really good this year. Sadly the melon was not sweet nor ripe, like eating watermelon rind, so that ended up in the trash. Tomorrow, we get more….I was harvesting on Wednesday, and carrots, beets and corn were on the picking list……I’ll have to start thinking on that one! 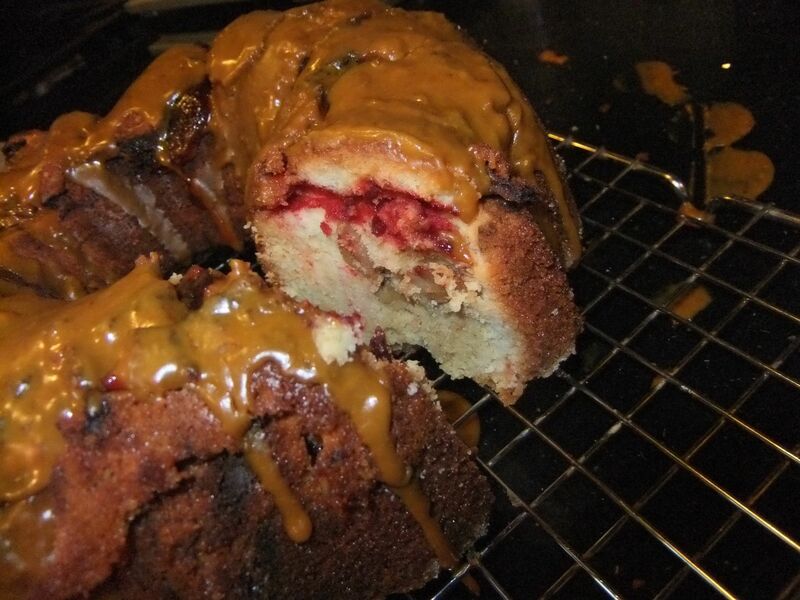 Keep cooking, eating local and sharing recipes you have with me…..or ask me if you need new ideas for your own meals! I am always happy to talk food. This Friday afternoon, the good farm provided us with corn on the cob, beans, squash in several sizes and species (zucchini, crooked neck, summer squash and patty pan), carrots, and cucumbers. I had a few spring onions left from last week, some haddock and fresh basil. 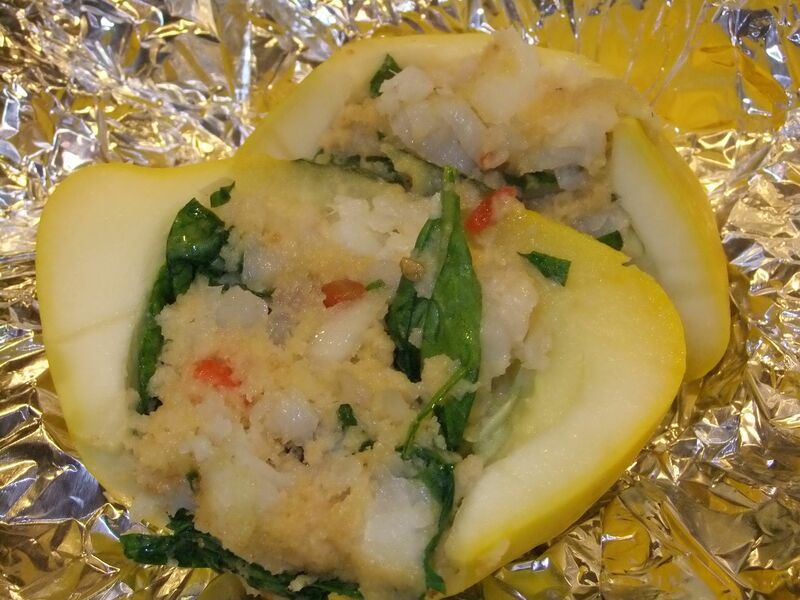 I decided to make a fish stuffed patty pan squash. I sauteed the onions, then stirred in a chopped small tomato, 1/2 cup baby spinach, 1/2 cup panko, 5 fresh basil leaves, the juice of 1/2 orange and 1/2 teaspoon of cherry wood smoked salt. 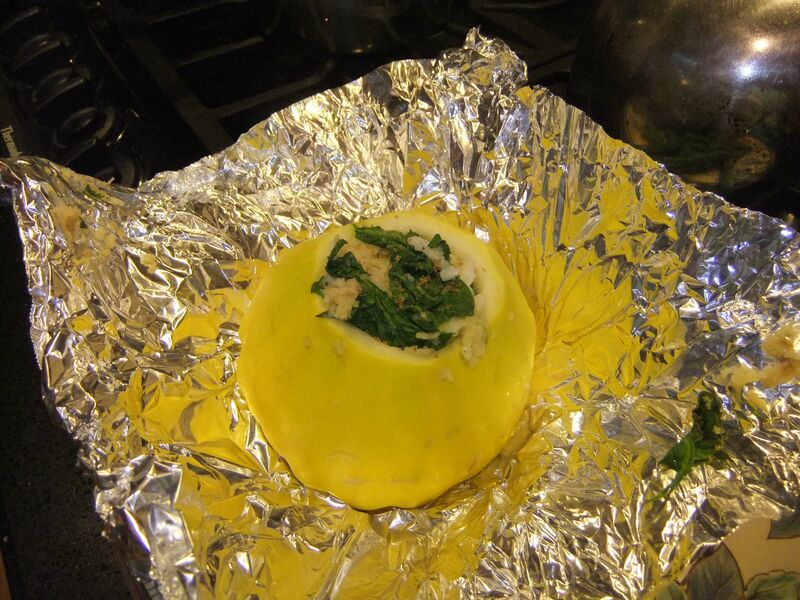 Soften a large patty pan squash in the microwave or by boiling 3-5 mins, scoop guts out and stuff with above mixture. Bake wrapped in foil at 400F for 15-18 mins. Delicious! OK, good start. The next day, I needed to use some of the squash. I layered sliced crook neck and green zucchini on top of a lemon thyme biscuit I crumbled in the bottom of a small baking dish with chopped scallions, a little cheddar cheese, and sliced tomatoes. I topped it with a custardy sauce of egg, milk, and chicken stock that I steeped fresh tarragon in, and added some chopped Brie. (OK, so I was using up some leftovers, shoot me). I crumbled the last biscuit on top, and baked covered for about 20 mins. Uncovered for 10-15 mins more until the custard had set. Delicious! Even good reheated the next day. Tonight, roasted carrots and fennel (I was supposed to be making a blueberry kohlrabi and fennel salad, but couldn’t find kohlrabi), cod and the corn on the cob. As for the beans, I am still figuring out what to make and the mini cuke was eaten at lunch with some radishes. A dear friend dropped off more beans, 2 cucumbers and tomatoes from his garden…..I need to start getting really creative with these squash and beans. Fried green tomatoes and crook neck squash may be in order with my smoked chicken Wednesday. Well another week in farm fresh produce. Hope your week is going well, eating better and enjoying the local harvest too. Bon Appetit!